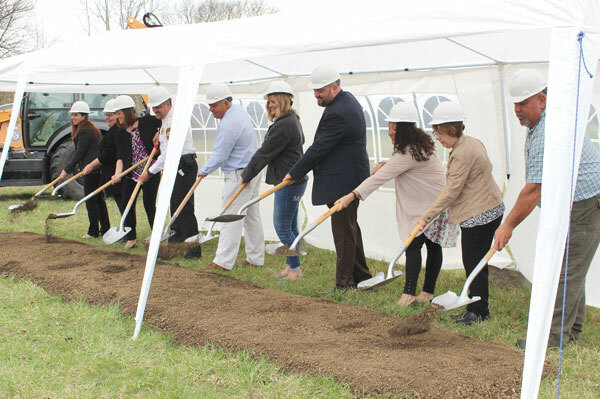 Plain City officials are shown above breaking ground for the new municipal building located on Village Boulevard. The new facility will house the administrative offices and police department. Pictured above, from left to right, are: Beth Rihl, project manager with Carney-Ranker Architects; Sherry Heineman, village council; Jody Carney, village council; Police Chief Dale McKee; Mayor Darrin Lane; Renee Sonnett, fiscal officer; Nathan Cahall, village administrator; Shannon Pine, village council, Kerri Ferguson, village council and John Rucker, village council. Plain City officials have broken ground for their new municipal building. A ceremony was held Friday at the location off Village Boulevard, directly west of the former Lovejoy’s Market building. The village purchased the 3.14 acres of land that will house the new 12,000 square foot facility for $290,000 in April 2018. The design for the building comes from Carney-Ranker Architects and will be built by 2K General Construction at a cost of $2.9 million. The village has a projected completion date of Dec. 1. New features in the building include a community room with more space available for public gatherings and new technology that will allow for the recording and live-streaming of public meetings. A prime selling point, however, has been the consolidation of the village offices. Currently, village officials, including the police department, are spread across seven different locations in town—three of which are administrative offices alone. The new municipal building will put all those departments as well as the police department under one roof. With the new space, some additions will come to the police department portion of the building including a detective’s office, training room, property and evidence room and interview rooms. It will also have a public access room, or “Safe Room,” that is automatically secured and is available 24 hours per day, seven days per week. “This new facility will make day-to-day operations and services of the village more effective,” Lane said. The efficiency is something that will ensure “taxpayer dollars are maximized,” he added. The existing administrative offices located on Chillicothe Street as well as the police department on Friend Street will both go up for sale.